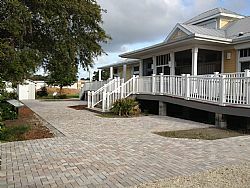 SARASOTA – The Florida House Institute recently installed a pervious pavement system featuring 1,800 square feet of pavers with support from a SBEP Bay Partners Grant. Other project supporters included Sarasota County, Oldcastle Coastal, Mullett Brothers, MasterRock, Rand Carter, and Todd Foster Landscape Design. The installed system features pavers that meet low impact development (LID) standards. They offer homeowners a great way to make a useful hardscape patio or drive while reducing stormwater runoff into the bay. Integrated into the pavement system were two ERIC Infiltrometers to provide ongoing monitoring of storage performance and the infiltration of water. Florida House Institute is committed to demonstrating LID strategies that help homeowners reduce the impact of stormwater pollution to enhance water quality. Florida House expects to reopen in the fall. The SBEP has awarded nearly $232,000 in Bay Partners Grants to support 113 organizations since 2003. A subcommittee with the SBEP Citizens Advisory Committee (CAC) selects the recipients. The next deadline for submitting grant applications is March 1, 2014. Visit SarasotaBay.org to learn more about the Bay Partners Grant Program.